My friend Fr. Johnson, USN, sent me a photo of his newly acquired Papa Ganganelli (aka Clement XIV Of Glorious Memory) coffee mug. Here it is, strategically situated in Father’s stateroom aboard USS KEARSARGE (LHD3). Fr. Johnson regularly celebrates the TLM while deployed with Marines, in port, or at sea. Everyone: I very much enjoy seeing your In The Wild shots. … and you could have your very own Papa Ganganelli mug! Impress your friends! Annoy liberals! Make Jesuits sweat! Did you know that the great impressionist painter Manet painted USS KEARSARGE? This one… the predecessor from the time of the Civil War. During the Civil War, USS Kearsarge sank the Confederate Alabama near the coast of France. It was widely covered by the French press. Manet painted the scene twice. This painting is in the Met in New York. The other is in Philadelphia. Manet visited the ship at anchor near Boulogne. 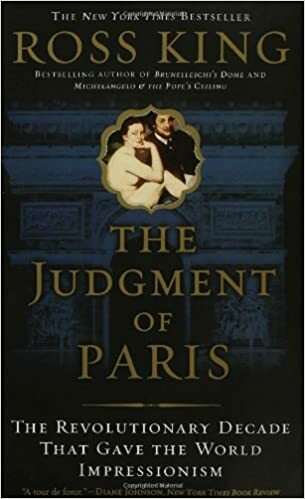 If you want to know more about Manet and the Impressionists, I warmly recommend Ross King’s The Judgment of Paris: The Revolutionary Decade That Gave the World Impressionism. This entry was posted in In The Wild, Mail from priests and tagged Clement XIV, coffee mug, Édouard Manet, In The Wild, Navy Chaplains, USS Kearsarge. Bookmark the permalink. 7 Responses to IN THE WILD! Clement XIV joins the Navy! If I am not mistaken, Theodore Roosevelt’s Uncle was the captain of the Alabama. The Captain of the CSS ALABAMA, Raphael Semmes, was one of several prominent Catholic officers in the Confederate forces. It’s been said that the story of Semmes is the story of the Confederacy at Sea, and he really was a remarkable seaman and maritime strategist. As a raider, he was the picture of civility. He never allowed his crew to steal or destroy the private property of any of the ships he raided, and he treated all prisoners with decorum and respect. By all appearances he was a devout Catholic, and actually attended Mass just before heading out to do battle with the KEARSARGE. The French were actually very pro-Confederate, and as the ALABAMA sailed past Manet the nearby French passenger ship, the NAPOLEON, cheered her and the band played “Dixie.” The KEARSARGE was heavier, better armed, had a larger crew, and was reinforced with iron plating, but even so it was a bitter fight that almost went the ALABAMA’s way save for one critical blow hitting the KEARSARGE directly in the stern but not detonating due to either faulty powder or fuse. Never heard that Semmes was related to Roosevelt, and I’m not able to confirm that through any of the sources I’m familiar with. Do you have a source, Fr. Lovell? I’d be very curious to know. Teddy Roosevelt was known to have been very sympathetic with the Confederate soldiers and sailors. I just want to know what ‘Lucky Jack’ or Stephen would make of these mugs. Thank you for the linke, Fr. Lovell! An excellent read, and in the New York Times, no less! Great photos and paintings. TLM at sea? Magnificent. Fr. Johnson: Fair winds and following seas. Speaking of paintings, the Naval Institute had an Artist-in-Residence, Tom Freeman (former Marine reservist and Army) until his death. He painted quite a collection. There is, for example, “China Lights,” the USS Constitution leaving Macao during her 1840s world cruise. I don’t recall the painting’s name, Freeman also painted the USS Houston battling alone at night a large Japanese naval task force in the Far East during early 1942. The night sky is absent moon and stars, rather, it is illuminated by star shells and searchlights. Powerful.